Heel height 3.9 inches; Crocodile leather; square heel, leopard-print, satin, buckling ankle strap closure, velvet, buckle, square toeline. Heel height 4.29 inches; Textile fibres, Soft Leather; sculpted heel, two-tone, polished leather, buckle, velvet, no appliqués, narrow toeline. Grey/black boots, heel height 11.5cm, height of upper 12.0cm. 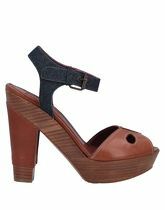 Camel court shoes (also available in Bipdp and Pacific), heel height 10.0cm. 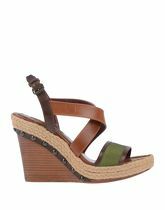 Heel height 4.49 inches; Textile fibres, Soft Leather; square heel, strap detailing, snakeskin print, animal print, canvas, glitter, round toeline. Bipdp court shoes (also available in Camel and Pacific), heel height 9.0cm. 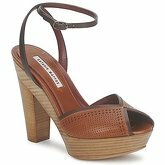 Brown sandals, heel height 12.0cm, leather upper, lining and insole, leather sole. Black sandals, heel height 9.0cm, leather insole, textile upper, leather lining, rubber sole.